The Ministerial session of the Council of Europe was held in Brussels, on May 19, 2015. During the session, the Chairmanship of Committee of Ministers was transferred to Bosnia and Herzegovina for the next six months. The Georgian Delegation which took part in the session was led by the Minister of Foreign Affairs of Georgia, H.E. Tamar Beruchashvili. Along with other important issues discussed by the member states of the Council of Europe, one of the main topics of the Ministerial was current conflicts in Europe. In the speech delivered during the session, the Minister of Foreign Affairs of Georgia focused on the current difficult situation on the occupied territories of Georgia, in particular, on the human rights violations on these territories by the Russian Federation, as well as the so-called “borderization” process and the so-called “treaties” signed between the Russian Federation and the Georgian Regions of Abkhazia and South Ossetia. 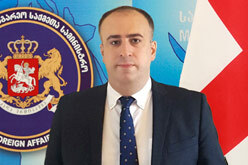 The Minister also referred to the decision adopted on May 12, 2015 by the Committee of Ministers’ Deputies’ of the Council of Europe, calling on the Russian Federation to grant unrestricted access to the Council of Europe bodies to the areas affected by the conflict in Georgia. Along with other issues, the Ministers highlighted the urgent need for the resolution of current conflicts in Europe and called on the Russian Federation to take effective steps in order to de-escalate the situation in Ukraine and Georgia, among others the Ministers expressed their support for Georgia’s sovereignty and territorial integrity. The Member states called on the Russian Federation to respect the international law and underlined the importance of using Council of Europe’s relevant mechanisms to monitor the human rights situation in the occupied regions of Georgia. In his concluding summary, the Chairman of the Committee of Ministers, the Minister of Foreign Affairs of Belgium, among other issues, underlined that so called “treaties” concluded between the Russian Federation and Georgian regions violate Georgia’s sovereignty and territorial integrity. The Chair emphasized on the so called process of “borderisation” and underlined that many delegations reiterated that these populations should enjoy the same level of protection of human right as other Europeans. The need for the Council of Europe monitoring bodies to have free and unimpeded access to these regions was also recalled. In the frames of the Ministerial, the Secretary-General of the Council of Europe presented the report on the State of Democracy, Human Rights and the Rule of Law in Europe. The Ministers of Foreign Affairs of the member states also discussed problems related to terrorism and the Council of Europe’s role in this regard. The Ministerial took note of the 11th Consolidated Report of the Secretary General of the Council of Europe on the Conflict in Georgia.